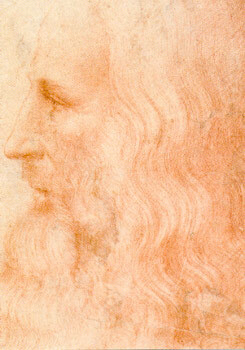 eonardo da Vinci, famous Renaissance painter (1452 - 1515) is universally known for his paintings and his inventive genius. The Metropolitan Museum in New York is presenting a collection of remarkable drawings. In her introduction to the exhibition catalogue, Carmen Bambach 1 underlines « the revolutionary character of his (da Vinci) faith in observation as a method of knowledge ». Among the many drawings, belonging to the Metropolitan Musem or a loan from 25 others collections ( Vatican, Louvre, Venice, Queen Elisabeth - London) are studies of falous paintings like : - The Virgin and Child with Saint Anne (Louvre, Paris). - The Adoration of the Magi. - The Battle of Anghiari (the painting itself has since disappeared). And Saint Jerome in the desert (unfinished painting) (Vatican). There are many antomical drawings, studies of plants, sketches of weapons and machines. Also there are drawings which form part of the « Water treatise », sometimes called « Drawings of the Flood », made at the end of his life (between 1515-1517), during a stay in France as the host of Francis I. 1 Person in charge for the Department of the drawings and printed of Metropolitan Museum of Arts. Our thanks to the Metropolitan Museum of Arts for providing the documentation and the photographs. from May 9th-July 14th 2003. Le Musée Guimet, des Arts de l’Orient. Qui sont les Celtes ?